G. Willow Wilson. Alif the Unseen (Grove Press 2012). I discovered G. Willow Wilson completely by accident; was just looking through the Graphic Fiction section of the local library, & came across the first volume of Air, a delightful tale of a airline stewardess afraid of heights, a small country that somehow got left off all the maps, & much else. I soon got Air 2, in which there’s a huge aircraft powered by some strange energy, not to mention the still youthful Amelia Earhart. Next I found Cairo, her first graphic novel, a slightly deranged, slightly supernatural, thriller with Israelis, Egyptians, an American caught among them, & the eldritch powers of ancient Arabia definitely involved. As the writer of all of these, Wilson demonstrated both an agile imagination, & a fine sense of wonder attuned to other ways of seeing the world. As a convert to Islam, she has clearly immersed herself in its whole history, concepts, & literary & spiritual traditions. Alif the Unseen is her first novel, & it’s a terrific whatchamacallit: Islamic-cyberpunk-urban-science-fantasy, perhaps? And winner of the World Fantasy Award for Best Novel (so I’m clearly behind the times here). Living in an invented Middle Eastern security state, the eponymous protagonist is a super hacker, whose system shields his clients (& he takes on everyone, from free thinkers to Islamists to political dissidents), protecting them from ‘the Hand,’ the head of the state’s security force, determined to control & censor everything within its boundaries (no Arab Spring here, thank you very much). Going by his hacker name, Alif, a half-Indian, half-Arab, whose father has more or less abandoned him & his mother, lives in the working class area of the City, but is deeply in love with a beautiful woman of the upper class. The story begins with her leaving him, & their affair, because her father has arranged a marriage with a prince of the realm. Alif, in despair, creates a program that, to his amazement, is able to detect anything she types, & so keep her apart from him online (& him apart from her). But this program could work for the Hand, & it turns out the Hand is her fiancé, who soon strikes at Alif & his clients. Before he knows what’s happening, he’s on the run, with a strange & powerful book, The Book of the One Thousand Days, his ex-lover sent him, the girl next door, Dina, whom he has known all his life & got involved in his mess when he asked her to return something to said ex-lover, &, eventually a number of the jinns & others who have always lived next to humanity, but have for some centuries been disappearing from human vision & understanding. Along the way, he finds some odd new friends & helpers, many of whom, due to his rather foolish stumbling actions suffer, as does he. Wilson has created a deeply foolish protagonist, whose failure to understand many of the people he knows puts them all in danger, but she has also made him an empathetic figure, as he tries to make things right. In choosing to make her point of view character a man, she put him in the midst of all the action in what is a rather patriarchal culture. But by letting readers perceive those around him, most especially Dina, as they aid or obstruct him, she also demonstrates just how strong women can be in this situation. Dina is especially interesting, for she chose to wear a burqa when she was just 13, despite her parents’ protest. although seen only through Arif’s perspective, she slowly emerges as the strongest, character of them all. Of course, it takes Alif almost the whole, thriller-like, tale to recognize her for what she is, as well as to recognize the good in many of the supernaturals he encounters. Alif the Unseen presents an Arab (& Islamic) supernatural world in a dryly comic noir style, with great verve & insight. Wilson has represented aspects of Islamic culture in a way that can both entertain & enlighten Western readers, while exploring both the good & bad aspects of Arab politics. 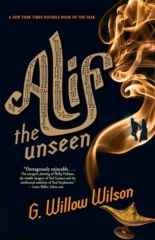 In the end, Alif the Unseen is one of the best & most provocative SF&F novels I’ve read recently, & G. Willow Wilson is definitely a writer to watch. Go read the graphic fiction, too: it’s fabulous. This entry was posted in SF&F. Bookmark the permalink.